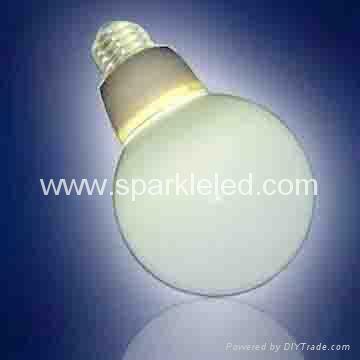 Characteristics︰ Sparkleled company's LED High Power LED Bulb uses High power LED from Edison Company. The bulb lamp uses frosted milky white glass cover. The High power LED bulb can replace directly of normal 30W-50W's incandescent bulbs. Application Areas︰ The LED bulb lamp is the ideal lighting sources for the advertising board, the show board outside the bar and the hotel, the outlook of the wall of building, the lighting project for the resorts, the decoration of stage, home lighting, coffee house etc.